Steve Branam promotes the experience of crafting something truly handmade and takes perplexity out of hand tools. In these pages, hand tool woodworking is a source of great pride, satisfaction and amazing results–not to mention less noise and sawdust. Readers are taken through the shop and tool set-up, from the endless array of chisels and mallets to workbenches and handplanes. You’ll learn proven methods for sharpening your tools, prepping your stock and timeless joinery techniques including mortise-and-tenon joints, dovetails, rabbets and others. 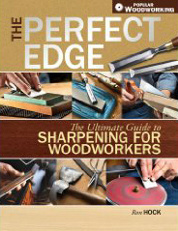 Within these pages you’ll find advice for selecting the tools you need and setting up shop, complete instructions for using the tools you reach for time and again, tuning processes for keeping your tools sharp and precise, and technique variations and alternate methods so that you can decide what works best for you in your own shop.